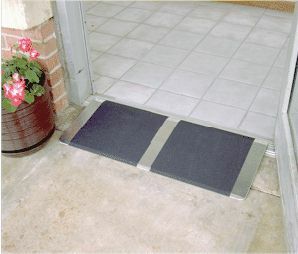 This small threshold ramp is designed for doorways and is available in 8", 10", 12" , 16" and 24" lengths by 32" wide. The ramp has holes punched in each of the top corners for easy installation. Made of aluminum and surfaced with anti-slip high traction safety tape, it is lightweight yet durable. Load capacity of this ramp is 300 lbs. per axle.